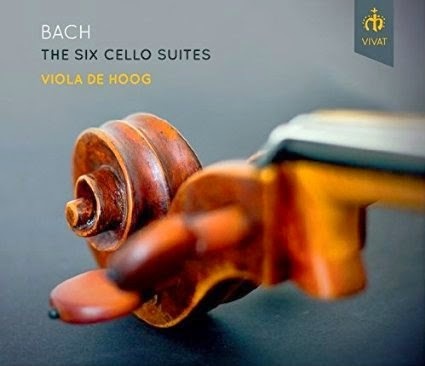 Bach’s Cello Suites have rarely sounded as attractive or as melodic as they do here in Viola de Hoog’s new recording for Vivat. These are readings of direct and uncomplicated elegance, in which beauty of tone and the evenness of melodic contour always take precedence. They are a little lacking in drama and emotional weight, but make up for that in the sheer vitality of the performances. The music here is always either singing or dancing, inflected yes, with subtle rubato and careful dynamic shading, but never to the point of seriously disrupting the dance meters beneath each of the movements. We are in historically informed territory here, so the strings are gut (although the lower two are over-wound), the pitch is 415, and there isn’t a hint of vibrato. There haven’t been many such recordings of Bach’s Cello Suites; the first was made by de Hoog’s teacher Anner Bijlsma in 1979. De Hoog’s readings are more relaxed the Bijlsma’s, more comfortable in their dance rhythms, and even more distant from the more dramatic tendencies of earlier generations of cellists. The Prelude to the First Suite, for example, usually builds in volume and intensity in the phrases leading up to the final cadence. Not so here; the movement retains its shape, largely thanks to the cleanly articulated harmonica progression, but the playing retains its intimacy throughout. Just a hint of rubato acknowledges the arrival at the tonic chord, just leaning on that first note of the bar for the fraction of a second needed to make the point. Tempos are never extreme, and if anything often feel slower than the norm. That allows de Hoog to bring out the singing quality in many of the more lyrical movements, such as the Sarabande of the Third Suite. And when the music needs propulsion and energy, de Hoog provides it more through the bounce of her articulation and her forward-looking phrasing than through extremes of speed, as in the final Gigue of the First Suite or the Courante of the Second. The first five suites are performed on a very attractive-sounding Guadagnini cello of c. 1750. For the Sixth, de Hoog moves to a recently restored Bohemian five-string cello c. 1780. It doesn’t have quite the same richness or evenness of tone, but offers the extra versatility (and notes) the final suite demands. The recording was made in a church setting, at De Oude Dorpskerk, Bunnik, The Netherlands. The resonance the space provides is ideal, adding warmth and context but without detracting from the detail. Credit here too to sound engineer Adriaan Verstijnen for the impressive audio quality throughout. As ever, the Vivat label provides impressive documentation of the music, performer, instrument and recording sessions. All-round, a very attractive release.